Top performers are competitors whether they are on the golf course or in the corner office. Do any of your best customers play golf? 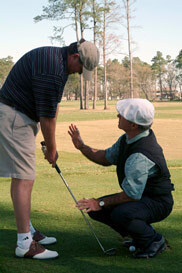 Have you ever developed better relationships with your customers on the golf course? Do you think the opportunity to have fun and improve your golf skills might prove to be an exciting and impressive motivational opportunity to the top performers in your organization? Put the power and passion that surrounds golf and getting better at it to work for you by allowing Marty Fleckman to create an unforgettable experience for you, your clients and your top performers! Marty Fleckman offers the unique opportunity of entertaining potential clients or treating employees to a round of golf with a PGA tour professionial. 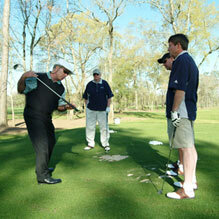 We offer a wide variety of options for any size outing. Make an impression with a once in a lifetime chance to play with a pro. 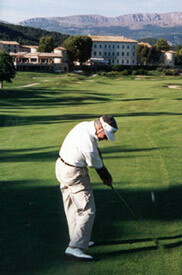 Please browse our package options or allow us to create a custom outing. The game of golf has an international draw that translates effectively to the exhibit industry. The goal of any exhibit is to attract new customers into your booth, giving you the opportunity to show off your service or product. Having a veteran PGA touring professional like Marty Fleckman in your booth demonstrating and offering golf tips will certainly attract the attention that will make your booth a success. Marty is available for a wide variety of exhibits and tradeshow demonstrations. Call today for scheduling, rates and availability.